Dear friends, we announce with deepest pleasure our next home land performance! 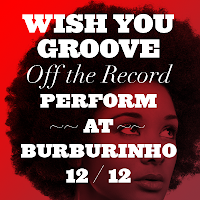 The event will take place at Burburinho, once called Nautico, on the next 12th of December. As always smooth positive grooves will sound great mixed with the joy of your laughs, memories and toasts. So grab your friends and show up! Great party and the nicest scenery next to the river. Let us give you a warm welcome!